When Ukraine decided to postpone an EU Association Agreement in 2013, few would have predicted that it would lead to a prolonged conflict in Europe's borderland. When, on 21 November 2013, former Ukrainian President Victor Yanukovych decided to postpone the EU Association Agreement, few would have predicted that this, in consequence, would lead to a prolonged inter-communal conflict in Europe's borderland. What started as a peaceful demonstration of support for Ukraine's pro-European course by thousands of people in Maidan Square in Kiev has developed into a vicious confrontation dividing families, communities and the Ukrainian nation. According to the UN Refugee Agency (UNHCR), since the beginning of the conflict, over 500,000 people have left their homes looking for a safe place elsewhere in the country, and hundreds of thousands have fled from Ukraine, mainly to Russia. By February 2015, over 5,000 have been killed and well over 10,000 seriously injured in the conflict in the Donbass. The scale of the human tragedy is immense and, at the time of writing, the conflict is getting increasingly intense and militarised, despite the official ceasefire imposed as a result of the Minsk Accords of 5 September 2014 and various subsequent agreements. Since the beginning of the confrontation, a lot has been written about its root causes, the motivations of the main actors, and possible scenarios for the future. However, in spite of the large number of analyses produced, few have looked at what came to be called the 'Ukraine crisis' from the point of view of Russo-Ukrainian relations, and grasped the perspectives of various groups involved, as well as the discursive processes that have contributed to the developments in and interpretations of the conflict. With this in mind, the editors of this volume have invited twenty-three world-leading academics, specialising in different areas related to Russia and Ukraine, to contribute to the following collection. The studies are divided into four sections: People, Politics, Propaganda, and Perspectives. The first section looks at the social make-up of Ukraine and focuses on its ethnic and linguistic diversity, as well as relations between the different ethnic groups. Due to the fact that the Ukrainian conflict has developed, at least partly, as a consequence of existing divisions that have exacerbated the differences between various groups, this section provides the basis for analysis of the conflict and helps to make sense of the underlying structure of the Ukrainian society. The section opens with an analysis by David Marples, which focuses on the ethnic and social composition of Ukraine's regions and the existing voting patterns. He argues that while regional voting is the most characteristic feature of Ukrainian elections, there are a number of additional factors that may affect voting preferences, such as the social position of the voter or initiatives of the candidate. The second chapter, by Nicolai Petro, titled 'Understanding the Other Ukraine: Identity and Allegiance in Russophone Ukraine,' analyses the political and cultural differences of traditionally Russophone regions of southern and eastern parts of the country. Petro argues that, in the Russophone areas, political conflict arises when the legitimacy of Russian culture in Ukraine is challenged. The third chapter, by Olga Onuch, presents the reader with an analysis of how Russians and Ukrainians view each other, the relations between the two countries, and the ongoing conflict. Her research suggests that Ukrainians and Russians do not generally view each other in a hostile manner: each side believes there should be friendly relations between the two countries; however, she notes that each side views the current relations between the two in a different way. This is followed by Denys Kiryukhin, who concentrates on the roots and features of modern Ukrainian national consciousness, nationalism and their historical development. He argues that there have been three main narratives which have shaped the modern Ukrainian national discourse, which can be summarised, following Patrick Colm Hogan, as reflective of heroism, sacrifice, and romanticism. Subsequently, Greta Uehling's chapter titled 'Everyday Life after Annexation: The Autonomous Republic of Crimea' presents the situation in the area annexed by Russia, focusing on the experience of Crimean Tatars (the indigenous ethnic group of the peninsula). It is fear and anxiety, she argues, that have altered the ability of ordinary citizens to act, while assaults on freedom have become an everyday form of social control. Ivan Katchanovsky then analyses the history of Crimea and its turbulent present, the periods before and after the secession, as well as the possible future developments in the area. He concludes that while Crimea, in its current status, is likely to remain a point of conflict between Ukraine and Russia, and between the West and Russia, the return of the territory to the Ukrainian state is virtually impossible. The last chapter of this section, by Mikhail Pogrebinskiy, concentrates on the experience of Russians in Ukraine historically and after the 2013 Euromaidan revolution. He argues that the crisis has reinforced negative attitudes to, and marginalisation of, Russians and the Russian-speaking population of Ukraine. The second section focuses on the political processes in Ukraine, Russia, and the world that have preceded the crisis, as well as the developments that have contributed to or, arguably, caused the current conflict. In the opening chapter of this section, Andrew Wilson evaluates the state of Ukrainian politics since the collapse of the Soviet Union and the subsequent emergence of Ukraine as an independent entity. He explains the processes of post-Soviet elite formation, the rules and pathologies of the system, and the role of civil society in the 2013 revolution. Ukrainian politics will remain a struggle between old- and new-style politics, he concludes, although it remains to be seen how much of the old informal politics has changed. This is followed by a piece titled 'The Origins of Peace, Non-Violence and Conflict in Ukraine' by Taras Kuzio that examines why, after two decades of peace, a violent conflict broke out on Ukrainian territory. He highlights four main factors that have contributed to the crisis: the rise of authoritarian and neo-Soviet political forces, the pattern of western-supported popular protests, NATO and EU enlargement, as well as nationalism and revisionism of Russian foreign policy. 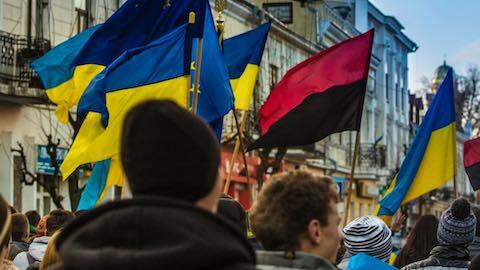 In the third chapter of the section, Marlene Laruelle discusses how the Ukraine crisis has affected the different Russian nationalist movements, explaining the popular narratives of Eurasianism and the Russkiy Mir, then outlining the contradictions between the two paradigms. She claims that the Ukraine crisis has fragmented the 'national-democrat' scene and has strengthened aspirations for the recreation of Soviet power – Russia's imperial mission – and the Eurasian Union project. The final two chapters of the section, by Peter Rutland and Edward W. Walker, look at the geopolitical roots of the crisis and the international developments since the collapse of the Soviet Union that have led to the current conflict. Rutland argues that it was Ukraine's geopolitical position, and the interventions of competing outside powers pursuing their own self-interest, which led to the continuing civil war in Ukraine. Walker, on the other hand, concludes that it was the post-Cold War security architecture and the enlargement of NATO that have played the main role in creating the conditions for and exacerbating the crisis. Following this, Paul Chaisty and Stephen Whitefield, in their chapter titled 'Putin's Nationalism Problem,' examine the new official narratives of Vladimir Putin's leadership, the problems associated with them, and how the Ukraine crisis has influenced the support for Putin's rule. They maintain that although the Ukraine crisis has contributed to the increase of support, the Kremlin will most likely fail to satisfy the aspirations of such a diverse group of moderate patriots and radical nationalists. The following chapter, by Elena Chebankova, seeks to understand the roots of Putin's popularity by analysing the political, structural, and discursive spheres of Russian political life. The secret of Putin's success, she argues, is his ability to recreate a narrative of the Russian structure in the new form and, in the context of the Ukraine crisis, embrace the long-established search for self-rediscovery of Russian society. The fourth analysis, by Stephen Hutchings and Joanna Szostek, concentrates on the main media and political narratives in Russia during the Ukraine crisis. They contend that the Russian media response to the crisis cannot be attributed to 'cynical eclecticism' alone, in the sense of exploiting whichever currents serve the needs. While they agree that such an instrumental approach has been present, the efforts to present dominant narratives in a form of a coherent worldview have also been apparent. In the next chapter, Marta Dyczok explores how the conflict has been portrayed by the main western media outlets and presents the dominant competing narratives. She concludes that while it is difficult to determine what impact international reporting on the crisis has had on public opinion worldwide, information has been used as a weapon, and thus the rules of objective reporting have worked against the goal of providing accurate coverage. Finally, Mikhail Molchanov focuses on the representation of Russia, Russians, and the crisis in the Ukrainian political and media discourse and the historical process of 'othering.' He maintains that in order to heal the ethno-regional split in Ukraine, the authorities in Kiev need to change their attitude towards Russia and the Russians. This final section concentrates on the possible future developments related to the various aspects of the conflict. In the first chapter, Richard Connolly focuses on the economic side of the crisis and seeks to answer the question of how the economic sanctions imposed on Russia by the West may affect the country's place in the global economy. He argues that by using the narrative of an external threat, the Russian leadership seeks to justify centralisation of political economy, which involves the suppression of economic competition, state control over strategic sectors of the economy (in particular finance, energy and defence), and the deterioration of the business environment in Russia. The second article, by Paul D'Anieri, focuses on the dominant views on the motivations of Russia's actions in Ukraine, the sources of Putin's legitimacy, and how the current crisis has threatened it. He concludes that for Russia to feel secure with regards to Ukraine, Ukraine needs to be geopolitically neutralised, and if neutralisation is not a viable strategy, then renewed stability would depend either on the West accepting Russian control of Ukraine or on Russia -- the loss of Ukraine. Subsequently, Edwin Bacon makes a case for narrative analysis as the most adequate tool to predict developments in international politics, and explains its importance in the development of future scenarios for Russia and the world following the Ukraine crisis. He claims that in relation to Russia, the scenario of authoritarian stability and global power alongside economic decline and consumer dissatisfaction is possibly a pertinent one. The penultimate chapter, by Alexander Osipov, focuses on the analysis of the state of diversity policies in Ukraine and its neighbours, including the Russian Federation, and the possible future developments in this area. He claims that diversity policy in Ukraine and Russia -- but also in Moldova and Belarus -- has similar features and focuses on recreating a narrative of multi-ethnicity, but with an ethnic or cultural core, and thus a hierarchy of ethnicities and languages. Finally, Richard Sakwa, in the concluding chapter of the volume, comes back to the systemic root causes of the conflict and argues that the confrontation in Europe's borderland is a result of three separate crises: the turbulence in the system of European security, the internal conflict in Ukraine, and the crisis of Russian developmental model. "Ukraine and Russia: People, Politics, Propaganda and Perspectives"